I was very happy to spend some time with my friend Lori last week and give her this scratchboard. I used as a reference photo one of her own photographs of a tree on her new property in upstate New York. Her house is called Heaventree as is this scratchboard. 28 Jan	This entry was published on January 28, 2018 at 4:08 pm. 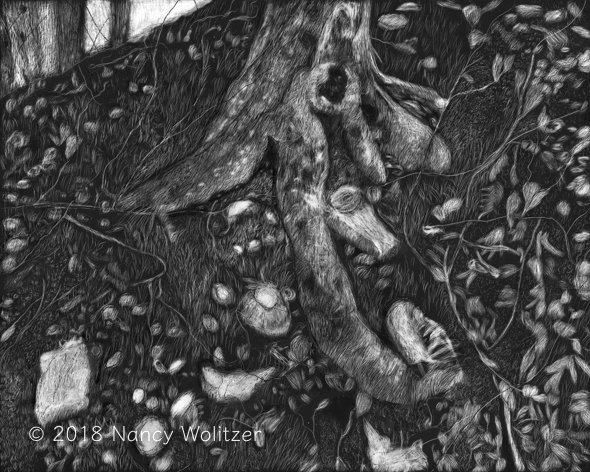 It’s filed under Artwork, Drawing and tagged Drawing, Landscape, Scratchboard, Trees. Bookmark the permalink. Follow any comments here with the RSS feed for this post. I love this drawing Nancy, its soft and mysterious. Heaventree – what a wonderful name for a house! Thank you, Anna. My friend named her beautiful home after her favorite passage in English, from Ulysses.